For remote staff staying connected to a company culture can be challenging. But provided you’ve set yourself up for success, you can be part of a company culture from anywhere in the world. When most people think about company culture, they think about something contained within four walls in a specific place. They might think about ping pong tables and a fridge full of soda. That is more accurately called “office culture”. A strong company culture, on the other hand, comes from people practicing the spoken and unspoken values of the company, wherever in the world they might be. But staying connected to a company culture remotely doesn’t happen automatically. You need to take deliberate steps to make sure you stay connected. Do it right and the company culture will be felt as strongly as if you were within those same four walls. We rely heavily on communication to maintain our culture. There are hundreds of tools that can help you, but what’s important is that you use a tool that most resembles how you would interact in real life. Slack. This is why no one hangs around the water cooler anymore. Perfect for a casual chat, banter, and funny GIFs. Google Hangouts. Meetings, team standups, and 1:1 reviews work well over a video call, and give you that all important face time. Screenhero. Working on a project together or debugging code? Screen sharing lets you feel as though you’re both sitting in front of the same computer. Whatever tools you use, just make sure it’s best suited to the type of communication. Just imagine having every casual chat in a Google Hangout, or trying to debug code via Slack. While it’s easy to go directly to someone who can answer your question right away, there’s great benefits to asking publicly. You’ll get different points of view, and start discussions to get a higher quality answer. It lets everyone jump in with any feedback they have – an essential part of our culture. It also means that anyone who didn’t know the answer can learn at the same time, and helps everyone get on the same page. There is a limit here though. 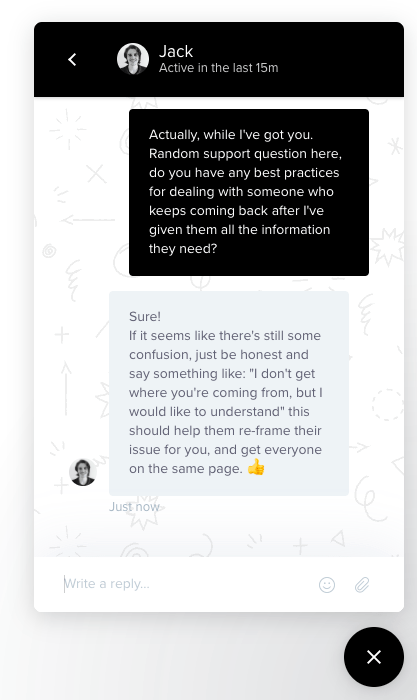 If you were in the office, you wouldn’t go shouting at everyone for an answer, so try to keep your questions focused to a specific team, and avoid commands like @here and @channel in Slack unless your message is mission critical. Being remote doesn’t make you any less entitled to contribute to your company culture. Working remotely means your in-person meetings are rationed, so make sure you feast when get the chance. If you’re visiting an office for any reason, say yes to every invite, and spend as much time face-to-face with colleagues as you can. Sure, you may find yourself without a second to spare, but the more time you spend collaborating with your team, the stronger those relationships will be when you’re remote once again. Meetings are great for collaborating but often their best purpose is to build human relationships. Proactively reach out to people, especially those who you haven’t spent much time with. A great place to start is asking for recommendations of local activities. You’ll find people much more comfortable going to their favourite places. Working in a customer support team, you’re the frontline ambassador of your company culture. Every time you interact with a customer, you have a chance to show the company values. This is an area where being remote shouldn’t be a barrier, so use customer conversations to internalize as much of the company culture as you can. Every interaction with a customer is an opportunity to showcase your company’s culture and values. For example, our culture is all about cultivating personal, respectful, long-term relationships with our customers, so all staff, remote or otherwise, bring that to every customer conversation. Your culture will be different, but the point is that if you display your company’s values on an ongoing basis, you’ll never feel out of touch with your company culture. If some team members are remote and the rest are in the office, there will be things you miss out on – company days out, social events, etc. But it’s important to realise you’re not being left out. For those in the office, over-communicating can often be better than assuming team members will find out through the grapevine. For remote workers, regardless if you’re present or not, engage anyway! For example, if your company is going go-karting, have the remote team place bets on who’ll win. There are plenty of other remote-friendly ways to share an experience with your teammates, like sharing music recommendations. If you’ve got a busy day ahead, sharing your favourite “Focus” or “Get-in-the-zone” playlists means you may as well be listening in the same room. Culture isn’t static, and needs positive contributions so that it really thrives. Being remote doesn’t make you any less entitled to contribute to your company culture. You were hired because you fit in with the culture, so it is your duty to build on it. There are many ways that you can do this. Sharing ideas on this blog works well for me, but it could be giving constructive feedback to a colleague, or proactively improving a part of your team’s workflow. Connection is a two-way street. So if you’re someone who employs a remote team, you need to maintain a level playing field by making sure your remote staff are constantly in touch with your culture. That’s easier said than done, but by setting up the right communication channels, and making sure everyone has access to the same information, it’ll go a long way towards making sure remote employees keep feeling the love.